When a tree dies...it is the roots that die first. When a person ages...it is the feet that age first. 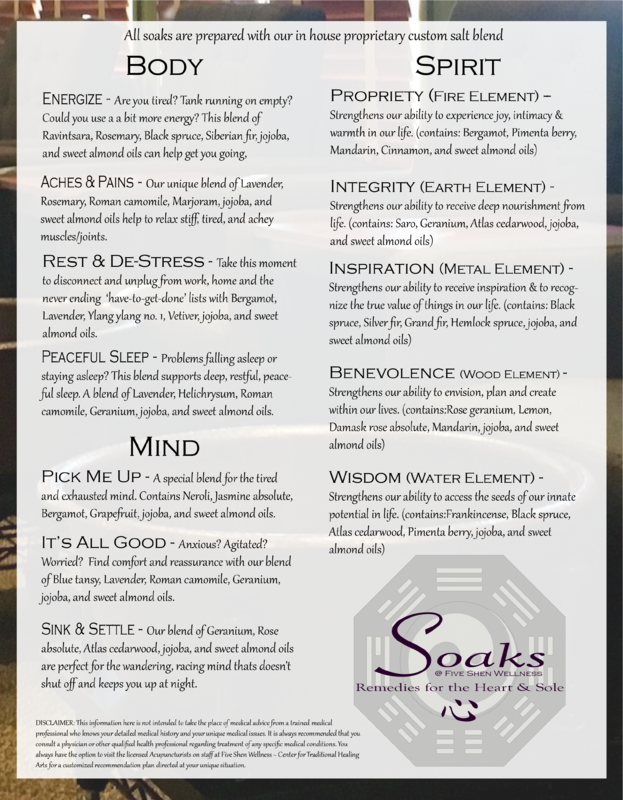 Soaks @ Five Shen Wellness is a shared foot soak experience created in order to allow you to relax in the tranquility of our beautiful space while enjoying a custom soak created specifically for you. Settle into on our quiet and comfortable space, soak your feet in our hand hammered copper soaking bowls, and enjoy a complimentary pot of tea while you take in the warm and relaxing 45-minute SOAK experience. Every detail meticulously created to leave you rejuvenated and relaxed while you escape the stresses of the day. Aside from the pampering and the relaxation that you will experience, Foot Soaks are therapeutic! Foot Soak therapies have been used in Eastern culture for thousands of years as a effective means to restore and/or maintain health. At Five Shen Wellness ~ Center for Traditional Healing Arts, our approach is always rooted in our knowledge and understanding of the traditions of Chinese Medicine. This knowledge and care is evident in our approach and will only improve the experience, taking the soaks to a completely different level unrivaled in the Upstate. This is TRULY an experience unmatched in Greenville! ADD ACUPUNCTURE - We are a Chinese Medicine Clinic first and foremost which enables us to ENHANCE your SOAK experience in a way that is unrivaled in GREENVILLE and the Upstate! Let one of our Licensed Acupuncturists pick a couple of simple yet gentle points to enhance the CALMING and RELAXING effect of the experience. JOIN US FOR ONE OF OUR REFLEXOLOGY CLINICS - Thai Foot Reflexology is a TRADITIONAL HEALING ART that's been used in Thailand for thousands of years as a way to keep a HEALTHY body, mind, and spirit. This system uses the reflex points on the feet along with energy lines on the legs with the intention of balancing and stimulating the movement of energy throughout the body. SO MUCH MORE THAN AN INDULGENCE! What the TIBETAN SOAKS are? The soaks are made from pharmaceutical grade herbs grown in a remote area of Tibet. The herbs are special to the region as they grow naturally there at altitudes that are still untouched and unaccessible by most of the world. Supply and access is limited and we feel blessed to have sourced these herbs that are so rare and pure for our patients at Five Shen Wellness ~ Center for Traditional Healing Arts. While the soaks are quite relaxing and enjoyable and have many health benefits, they are not a Spa treatment (even though it may feel like it). They are not in any way related to the ionic foot detoxes that are being marketed as 'the next great thing' and they are not simply essential oils in a tub of water. Tibetan Herbal Foot Soaks are excellent for people who experience (or are dealing with) stress, tension, high blood pressure, insomnia and fatigue. Because these soaks promote and stabilize circulation, they are also great for enhancing metabolism, increasing immune system function, relieving both systemic chronic pain & localized acute pain, and digestive issues. Under the supervision of our team of practitioners, Tibetan herbal foot soaks have shown to be quite effective for those dealing with internal health conditions, even shortening treatment times for those who area dealing with stubborn chronic conditions. The Intention: The herbs are prepared in a soak by our Herbalists who have studied extensively the Chinese Pharmacopeia. The formula used can be modified and tailored to treat various conditions that may be unique to the individual. The intention is to open the channels, increase circulation and allow the body to absorb the herbs as a form of treatment or therapy. It is a therapy that has been used in Chinese Medicine for thousands of years with great benefit. Temp: 100-113 F degrees. 48-43 C. Keep adding hot water. We take care of this for you in our office. At home, you will want to use a thermometer and add hot water every 10 minutes or so. Use best water available. However you can use tap water if that all you have access to. Sensation: The sensation of the Tibetan Herbal Foot Soaks occurs in stages for most patients. You will feel heat to feet, up to shin at first. Over a couple of weeks you may feel warmth between kidneys, a pulsing feeling, eventually spreading throughout entire body as it impacts circulation. Avoid using this foot soak herbal formula if you are pregnant, have metastatic cancer or other situations that you should not move blood. Avoid foot soaks if you have any open wounds, bleeding disorder, infection, or burns. Be cautious when you have a cold or allergies. Be cautious on children. Please consult with a qualified practitioner for children. Avoid doing foot soaks under draft or outside.